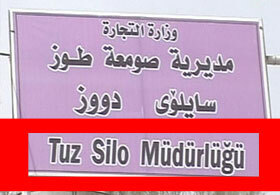 Here's a short article in Turkish on street signs in Kirkuk written in Turkish, due to the Turkmen population there. The total number in Iraq is anywhere from 500,000 to 3 million. According to the 4th article of the constitution of Iraq, areas with large number of ethnic minorities are permitted to have signs written in their language as well as Arabic. In areas with a large Turkmen population (Kirkuk, Arbil, Tal Afar, Mosul) schools can be conducted in Turkish, and one can find TV, radio and newspapers in Turkish as well. Although the language spoken by Iraqi Turkmens is South Azeri (not Turkmen as spoken in Turkmenistan), if you look at the home page for the Iraqi Turkmen Front (Irak Türkmen Cephesi) you can see that it's written in standard Turkish, not Azerbaijani as seen in Azerbaijan. Their page is also written in English, Arabic, and Persian.